Last week, the U.S. news media turned inward. For the first time in nearly two months, a domestic—rather than international—crisis led the news as the threat of a government shutdown (averted at nearly the last second) was the No. 1 story. A closely related topic, the overall economy, driven by Representative Paul Ryan’s controversial 2012 budget blueprint, was the second-biggest topic. The two domestic issues combined to fill 40% of the newshole from April 4-10, according to the Pew Research Center’s Project for Excellence in Journalism. The two overseas events that have been dominating the news in recent weeks—turmoil in the Mideast and the earthquake in Japan—accounted for less than half as much attention (18%). Just one week earlier, those foreign stories accounted for 50% of the overall coverage compared with only 15% for the economy and the threat of a shutdown. The looming government shutdown, avoided with a late-night compromise on April 8, topped the news last week, at 29%. For much of the week, the narrative functioned as a countdown clock to a potential stoppage, zigging and zagging as prospects for a deal rose and fell. Both sides also used the media to amplify strategic talking points, as Democrats portrayed Republicans as fighting over social issues and Republicans depicted Democrats as wavering on spending cuts. 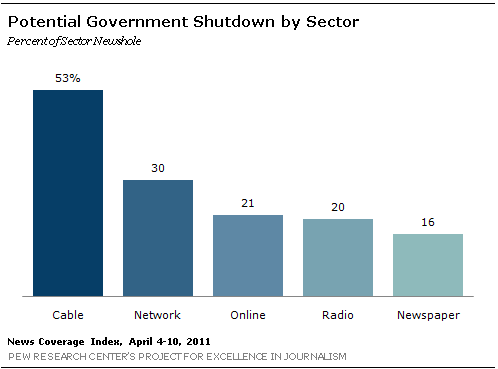 The shutdown maneuvering was the top story in four of the five media sectors studied. But as is often the case with a politically charged issue, it generated the most attention by far in the cable news sector—accounting for more than half the airtime, 53%, studied by PEJ. The week’s No. 2 story, at 11%, was the U.S. economy, which prominently featured Ryan’s dramatic 2012 budget blueprint that contains major spending cuts and significant changes to Medicare and Medicaid. The economy was the top story, 21%, in the newspaper sector. The third-biggest story, also at 11%, was the turmoil in the Middle East, dominated again by the civil war in Libya. But the real news is how precipitously coverage dropped from the previous week, when it accounted for 38% of the newshole. Last week marked the lowest level of Mideast coverage since the story exploded in the U.S. media with massive protests in Egypt in late January. The No. 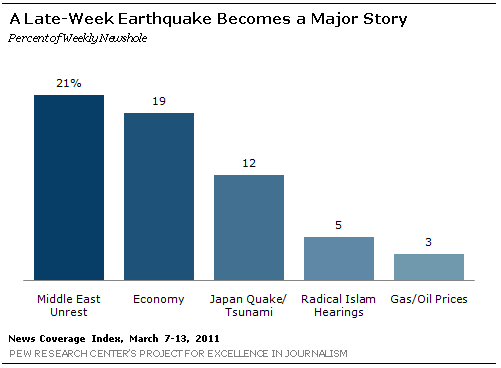 4 subject, at 7%, was coverage of the aftermath of the Japanese earthquake and tsunami. Coverage has steadily diminished in recent weeks and is down from 12% the previous week. The fifth-biggest story, at 5%, involved U.S. anti-terrorism efforts with coverage fueled by the news that the U.S. will try alleged 9/11 mastermind Khalid Sheikh Mohammed in a military court at Guantanamo Bay. In many ways, last week’s run-up to the last-minute budget deal was a made-for-media event. There was plenty of drama with the looming deadline, there were a few key players to focus on—President Obama, House Speaker John Boehner and Senate Majority Leader Harry Reid—and there was constant toggling back and forth between optimism and pessimism. On Friday, April 8, Fox News host Bill O’Reilly addressed the competing arguments over who was to blame for the stalemate: “Some people say money remains the issue blocking a budget deal—how much federal spending to cut. Others say ideology is in play—that conservatives want to cut things like Planned Parenthood and Democrats do not.” O’Reilly made clear his view that Planned Parenthood should not receive government funding. Finally, on Friday night, the two sides announced an agreement to stave off a shutdown, one that entailed $38 billion in spending cuts, but without riders that would have cut funding for Planned Parenthood and some environmental regulation. And the media quickly switched to post-mortem mode. On Sunday April 10, the New York Times asserted that, “both sides are declaring some victories, and details of the full impact of the cuts have yet to emerge.” And the story also evaluated the political fortunes of two principal players. But if this year’s budget was the major newsmaker last week, a dramatic 2012 budget blueprint from the Republicans—setting the stage for a battle down the road—accounted for the vast majority of the week’s economic coverage (11%). The reaction, as sampled on MSNBC’s April 6 Countdown show, was largely partisan and predictable. With the near-term government shutdown averted and Obama slated to lay out his own fiscal blueprint this week, the coming battle over more sweeping deficit reduction may be the next major economic storyline. Coverage of the Mideast, which was once again dominated by events in Libya, was down dramatically last week. It generated the most attention in the online sector (15% of the newshole) where it registered as the No. 2 story. A good deal of last week’s coverage involved signs of tension between NATO forces and the rebel fighters they are backing with the rebels complaining about a lack of NATO military support and news of a NATO airstrike that inadvertently hit rebels forces. With no definitive military resolution in sight, the U.S. media appear to be disengaging from the conflict. At the same time, attention to the aftermath of the Japanese earthquake, driven again last week by concerns about radioactivity leaking from the damaged Fukushima nuclear plant, continues its downward trajectory. It too, generated the most coverage (11%) in the online sector, which tends to be more oriented toward international news. Last week’s storylines included fears about the safety of seafood coming from Japan. Finally, the fifth-biggest story—the decision to try Khalid Sheikh Mohammed in a military rather than civilian court—represented a major reversal of course for the Obama Administration. An Associated Press story indicated how much backlash the civilian trial idea had generated. Three key legislators came next. Paul Ryan, chairman of the House Budget Committee, was the No. 2 newsmaker, registering in 2% of the week’s stories. House Speaker John Boehner was No. 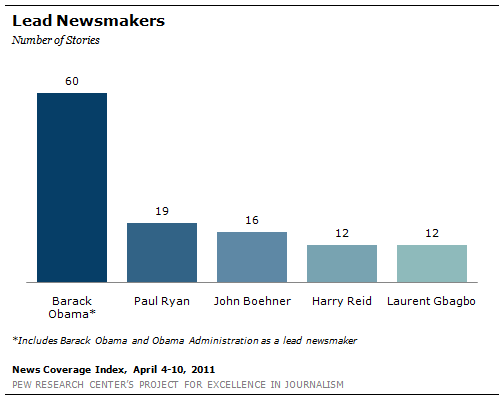 3, also at 2%, while Senate Majority Leader Harry Reid was a dominant newsmaker in 1% of the stories.